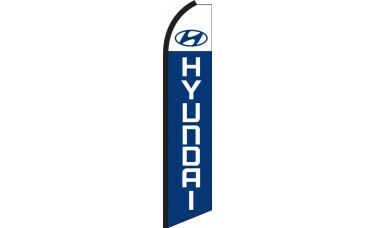 Our Hyundai Swooper Feather Flag features an upper white field printed with the Hyundai emblem in blue. Beneath this is a blue field with the Hyundai logo text shown in white. This flag is ideal for Hyundai dealerships looking to attract new customers. We are not affiliated with, endorsed by, or sponsored by any company whose logo(s) or name may appear on this product. It is the responsibility of the purchaser to ensure that the end user has obtained the required rights or permissions.